A stone tool, usually used in wood-working. 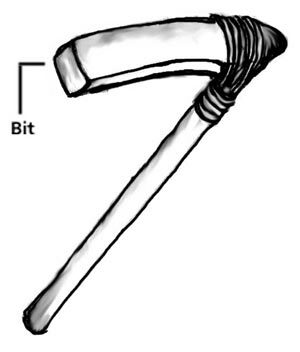 An adze has its bit, or cutting edge, at a right angle to its handle, as opposed to an ax, the bit of which is parallel to its handle. 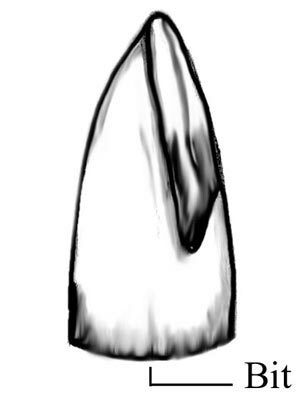 Illustration by Duleepa Wijayawardhana based on original by Ralph Pastore. A projection on the edge of a weapon that prevents the weapon from detaching from the prey. A structure with two somewhat circular areas or sections. For example a Palaeo-Eskimo bilobate house. An early Palaeo-Eskimo bilobate structure. This structure includes a mid-passeage hearth. The shaded rocks were set on edge in the ground. The cutting edge of a wood-working tool. A blade is a special sort of flake, shaped like a prism in cross-section, rectangular, and struck from a prepared core. 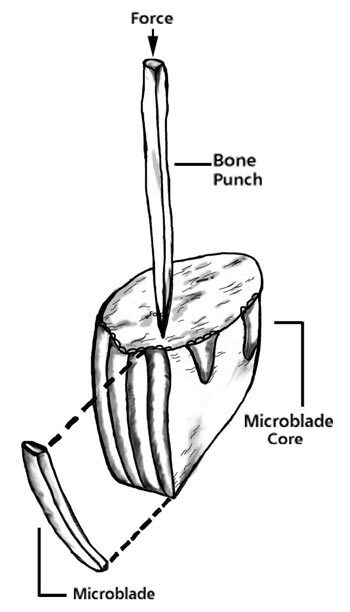 Blades wider than 5 cm are called macroblades; blades narrower than 5 cm are called microblades, and are struck from a microblade core. 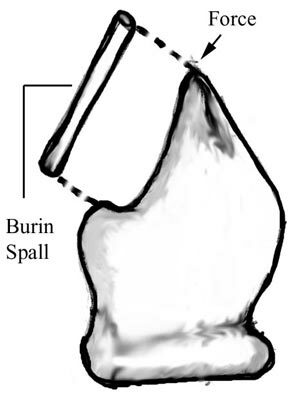 A stone tool, from which flakes, called "burin spalls", are removed in order to create a sharp edge that is used to carve grooves, commonly in bone or wood. A hard variety of sedimentary rock, similar to flint. It breaks in a predictable fashion which made it highly desirable for precontact toolmakers. A rock, often about fist-sized, from which flakes or blades are removed. An archaeological culture refers to the pattern of remains left behind by a distinct group of people. Culture in the anthropological, as opposed to the archaeological, sense can be defined as the sum total of socially-learned and transmitted behaviour and thought. 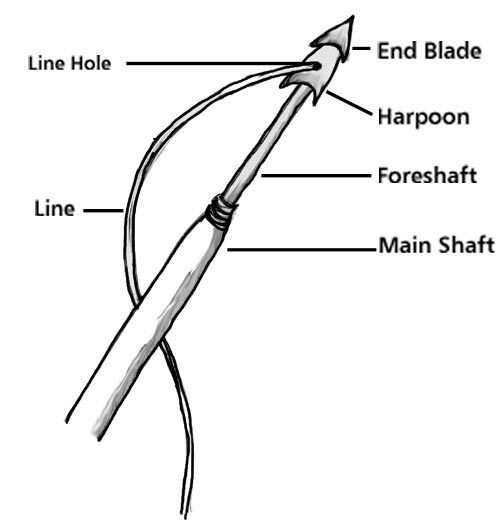 The stone or metal point of a harpoon. A small piece of stone deliberately removed from a larger piece of rock such as a core. A large knife used by the Inuit and their ancestors to cut blubber and skin from sea mammals. Often made from slate in the precontact period and iron in the historic era. A woodworking tool usually of stone, with a hollow chisel-like edge; used for hollowing bowls, dugout canoes etc. A place where a fire was deliberately maintained. 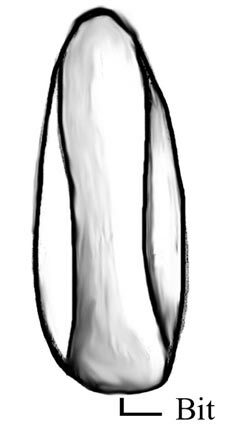 A thrusting or throwing weapon with an attached line usually associated with sea mammal hunting. The harpoon head is either barbed or twists (toggles) in the wound so that if will not detach and allow the prey to escape. A large ceremonial structure in which the Inuit and their ancestors carried out a variety of rituals. A small rectangular, parallel-sided flake with a prismatic cross-section struck from a prepared core. Usually associated with Palaeo-Eskimo culture. A specially prepared stone from which microblades are removed either by pressure or by means of a bone or antler punch and hammer. 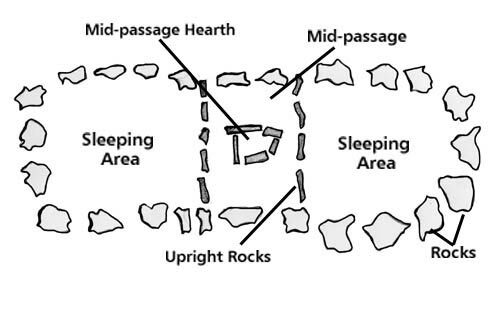 A place where a fire was maintained inside a Palaeo-Eskimo mid-passage house (i.e., a house with an entry in the middle and a clearly defined "passage" separate from the sleeping area of the house). A generic term used to describe bone, stone, or metal points for arrows, darts, lances, and other projectiles. A bone or stone tool used to scrape the fat from hides in order to prepare the skins for use and often for working wood and other organic materials. A harpoon with a detachable head which, when driven into an animal, twists, or "toggles", in order to secure the prey. The harpoon head is attached to a line held by the hunter. A semi-circular "woman's knife", used by the Inuit and their ancestors, commonly made from slate in the precontact period, and iron in the historic period.